Home > Uncategorized > New Year – New Devices! Happy (belated) New Year! 2015 just started and it already feels like we’re 6 months in! Course I started the year off with a sinus infection and bronchitis so that might have something to do with it! Gavin’s adaptive stroller has been ordered (thank you again to all that helped make that happen)! Now we sit and (not so) patiently wait for it to come in. Since it’s “made to order” there’s no way to know exactly how long it will take to come in (sigh). 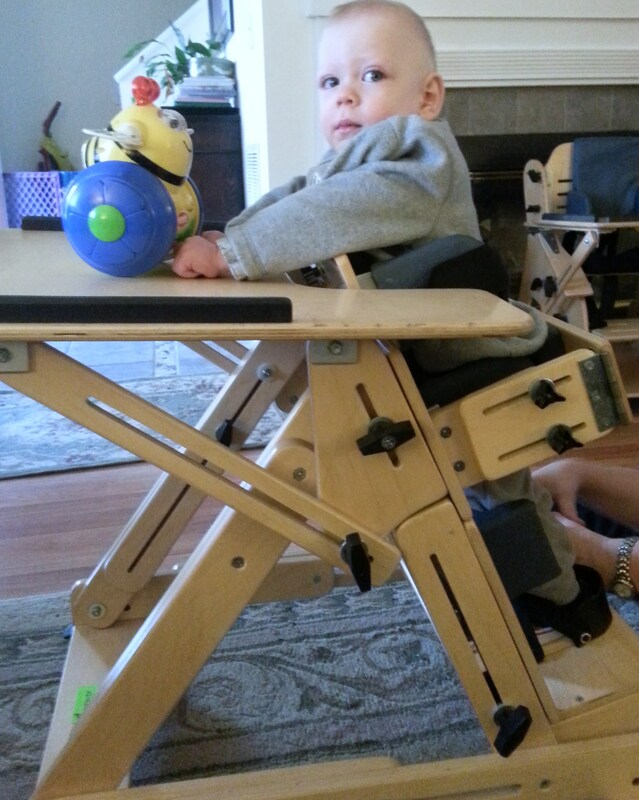 In the meantime, Gavin’s PT was able to snag an adaptive stander from NEAT Marketplace in Hartford! It’s a little big (even after downsizing it for him) but he will grow into it and he seems to like it (ignore the stink eye he’s giving me in the picture below – his PT was still adjusting the heel straps). The stander will help him learn to well, stand! He’ll start to understand what it feels like to bare weight on his legs and get those muscles working! As the leg muscles get stronger, so do the hip sockets – which will help prevent hip dysplasia as he grows. This is a HUGE deal for him. To start, he’ll only use it for 10-15 mins at a time and slowly build up to an hour. He was exhausted when we took him out this morning (although he did well and didn’t once complain). He’s using muscles he isn’t used to using so it took a lot out of him. But he was smiling and laughing away so I can’t complain. Next up: Gavin has an appointment with a new specialist. We’re going to see if he would benefit from medication that would help to relax his muscles and stop some of the toning he does and help him to have better use of his hands/arms. I have my reservations about starting him on any kind of long-term medication at this age but that’s one of the reasons for seeing this specialist. The appointment is at the end of next week so I’m sure another update will be coming. I’ve saved the best news for last!! For the very first time, this past Saturday (1/17) Gavin CLEARLY said “mom” – not once but TWICE! Course he hasn’t said it since – the stinker! But like all kids his age – Gavin likes to tease and it’s VERY clear that’s exactly what’s he’s doing. Previous Post: Pre-cursor to a milestone: self feeding!